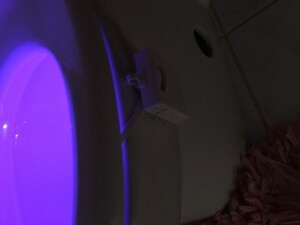 I was able to test out the illumibowl toilet night light recently and I want to show you how it works. 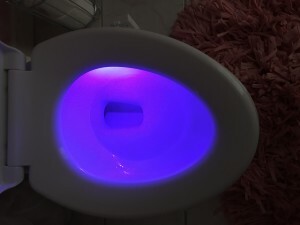 This is a motion sensitive light that you attach to your toilet to light up the inside of the toilet at night. You won’t need to turn on the lights in the bathroom anymore at night when you use this light. I attached it to me daughters toilet and took some pictures to show you. Its very easy to attach and fits any toilet. The lights can also change colors. This is great for kids bathrooms or even adults who dont want to turn on the light at night. This is also good for potty training. All you do is attach it to the toilet and close the lid. 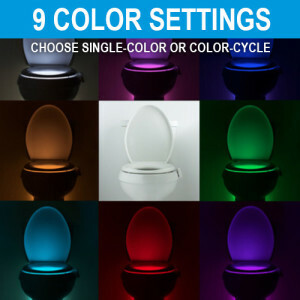 It will work only when its dark in the room and when you lift the lid or come near the toilet the light will go on. There is an on/off switch and a switch to change the colors every couple seconds. The are 9 color settings. My daughter is 12 and she loved it, her friends came over for a sleep over and all wanted one for their bathroom. 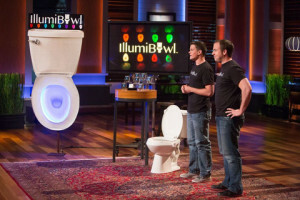 This is the same toilet light that was seen on the show Shark Tank. Below are the pictures. I saw the shark tank episode. Cool product.